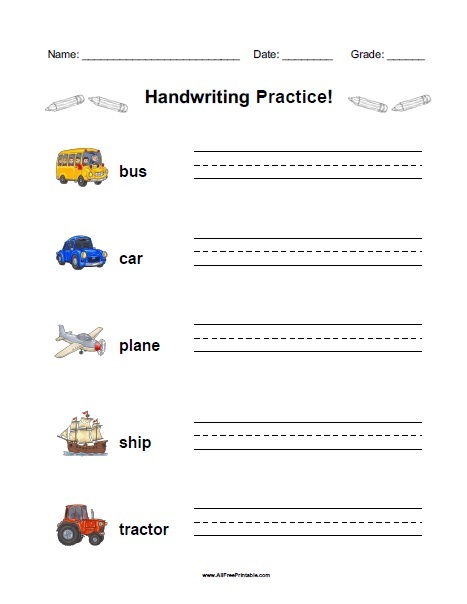 Free Printable Vehicles Handwriting Practice Worksheet. Free Printable Vehicles Handwriting Practice Worksheet, a fun activity with colorful types of vehicles that you can use for writing practice. Teachers, tutors and parents can use this free ready to print resource at school, tutoring and homeschooling. Share this free printable with your kids or students to improve writing skills. Your students can write 5 words like bus, car, ship, plane, tractor. Print this Vehicles Handwriting Practice Worksheet available free in PDF format. You’ve misspelled “practice” on your printable. Sorry for the error. Error corrected. Thanks.